LTI offers its line of reverse polarity SMA connectors. The ROHS compliant RPSMA from LTI are in stock and ready to ship. 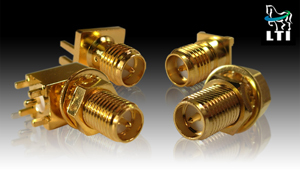 They are available for PCB termination or to attach to a variety of custom coaxial cable assemblies. They are designed for wireless systems manufacturers complying with FCC 15 regulations. Reverse Polarity SMA connectors from Lighthorse Technologies, Inc. are reverse gender, meaning the jack(female) houses the contact pin and the plug(male) houses the receptacle. Reverse polarity SMA connectors are unmatable with standard coaxial connectors. Reverse polarity SMA connectors operate at 2.4/5.8 ghz frequencies at a constant 50 ohms of impedance.. Typical applications for RPSMA connectors include Wi-Fi Systems. With production in San Diego, CA, adjacent to what has been referred to as "telecom valley", LTI remains poised to offer quick turn cable assemblies to meet the specifications of a demanding and rapidly growing global wireless revolution. Contact Lighthorse Technologies, Inc. for more information. Click here to browse LTI Reverse Polarity SMA connectors.